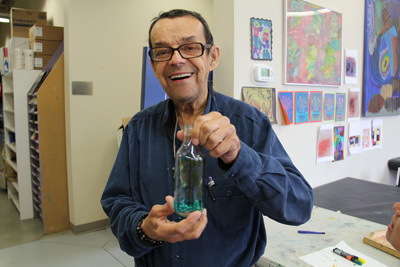 John was raised in Ontario and had his first exposure to art at Soogoma workshop. He was taken out of the public school system in grade 5 and never went back. He came to Alberta in 1984. John enjoys bowling, movies and television. He has been practicing as an artist at the Nina for very long time. He started working in painting and drawing, worked in ceramics for a time but has now established a focus as a print artist. He enjoys accomplishing complex reductive linocut prints of buildings, landscapes and animals.